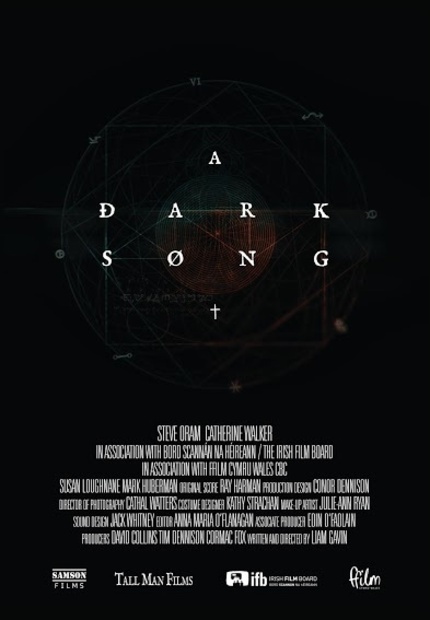 Liam Gavin's A DARK SONG is going to be one of those films that splits audiences. Those who need action, blood, gore and guts are going to drift off some where about the half hour mark. Those ho can go with it's slow burn long haul approach are going to be rewarded with a film that will potentially move them and result in long sessions of debate. The plot of the film is a simple one. A woman asks an occultist to perform a a ritual which will result in both of them getting what they want. He warns her that in order to do the ritual she must do whatever he asks of her and must be willing to to not leave the house for the six to eight months involved. She agrees but things deteriorate as she begins to change the conditions. What should be a relatively straight forward ritual becomes compromised, more so as the pair begin a battle of wills. Slow building suspense and fear is instilled in the audience thanks to Gavin's low key approach. The dangers are not so much the things that go bump in the night so much as each other's psychological baggage. Yes we are scared because things knock and rap on the floor boards, but also because we can't be certain what the characters to will do next. Of course as things go on the spirits seem to be be more present which complicate matters further. This is a carefully modulated film with perfect choices from cast to music to cinematography. I can't imagine anything being better. Its a film that is going to delight anyone willing to go with it and not mind it's very intentional pace.